The list itself is hosted on nodeclipse.org server and is updated independently. In a way, this is alternative for marketplace client (that sometimes needs several second before you can enter what you look for). Current version can't check if the plugin is already installed. 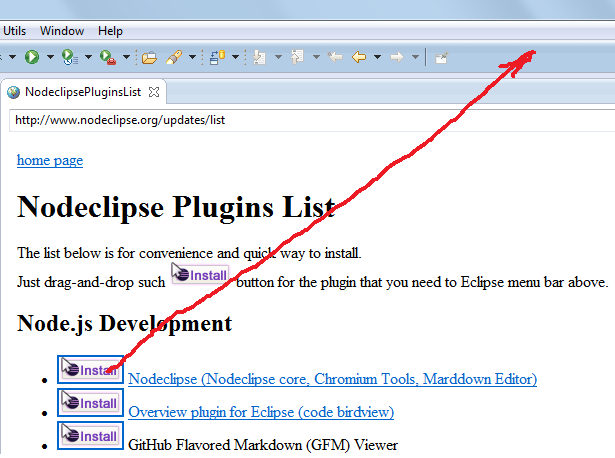 Please contribute to the list with plugins for Node.js & Eclipse development that you know. https://github.com/Nodeclipse/www.nodeclipse.org/blob/gh-pages/updates/l... That means that this is open-source solution that anybody can contribute! Attention: be sure to updating JDK to the latest release, as Eclipse Kepler with Internet Explorer (on Windows 7) may crash on old JDK in some cases (e.g. if you navigate away from opened page and then close the window). By adding the following code below to your website you will be able to add an install button for Nodeclipse Plugins List. This had really made my development life much simpler.